Preheat oven to 350 degrees in a convection oven; 375 in a regular oven. Combine cranberries and liquid sweetener in medium saucepan. Bring to boil. Reduce heat and simmer until cranberries pop, about 10 minutes (or less). Use the back of a wooden spoon to make sure all berries are popped. Spray a 10-inch cake pan. Pour in cranberry mixture and spread evenly. Let them cool while you prepare batter. In a medium mixing bowl, sift together dry ingredients: oat flour, baking powder, baking soda, cinnamon and cloves. You can grate the fresh orange zest into the dry. In a food processor, puree the fresh banana, scraping down sides. Add applesauce, sweetener, vanilla. Process until fairly smooth. Add wet to dry, mixing with a spoon. Be sure to incorporate all flour from bottom of bowl. Slice fresh pear into quarters and core. Slice each quarter into 3 slices and arrange in the cranberries in pan, like spokes in a wheel. Bake for 22 minutes, or until center tests done with a toothpick. Let cool on a cake rack (or “rush” it by putting pan in freezer). It doesn’t have to be completely cool before you flip it over on a serving plate. 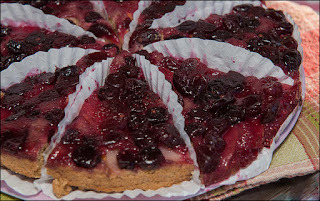 Any cranberries that remain on the bottom can be picked up with the spatula, and spread on top of the cake. Now you have a beautiful cake that is whole-grain, gluten-free, with no refined sugar or added fat. Keep the cake covered in the refrigerator so it doesn’t dry out (it has no oil), although it can be out at room temperature all day. Can be served with vanilla Soy Delicious! Green Heart is typically at St. Phillips Plaza farmers market on Saturdays, and at Rillito Park on Sundays. Check website or Facebook page for schedule. We make special orders all the time, too! Whether you are visiting this website because of Yelp, or Divine Munchies on YouTube, or photos you've seen on Facebook (Green Heart Bakery) or Instagram (#alaineshrewsbury), or the classified ad in Desert Leaf -- welcome! Tucson is such a diverse and different area than Southern California that I do many different things here -- and that can be confusing for new customers. No, we do not have a "brick and mortar" location. Licensed to work out of the banquet kitchen at La Mariposa on Houghton, we sell at the farmers market and make special orders. Yes, we mail muffins, cookies, brownies, apricot date bars, via USPS Priority Mail. An order of Chocolate Oat Bran Muffins wrapped for mailing. Muffins flavors include: Carrot Cake, Pumpkin Cranberry or Pecan, Blueberry Oat Bran, Lemon Raspberry, Banana Chocolate Chip, Chocolate Oat Bran, Blueberry Blue Corn, Orange Pineapple w/Coffee Cake Topping. Please call 520-954-2409 to place an order with me. Yes, every Sunday, Green Heart is at Rillito Park farmers market (4502 N. 1st Ave 85718) with a wide variety of bakery goods AND savory: entrees, a hearty soup, several kinds of sandwiches, and sides. (Scroll down; the 2 previous posts list sample menus from Sundays in July). We change to winter hours on Sunday October 8th, which are 9 am to 1 pm. The bride chose gorgeous flowers for her cake. Yes, I make birthday cakes, special occasion cakes, and wedding cakes. 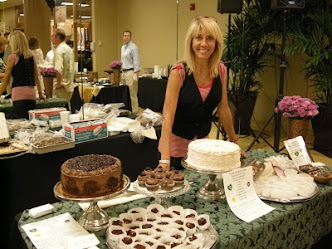 My specialty is cakes with "clean" ingredients (hence, no fondant), and adapting to special diets/food allergies. Call me to discuss your dietary requirements, and I can make you a special cake or dessert. Yes, I deliver an assortment of savory dishes (and a few desserts) to New Life Health Center, 4841 E. Speedway, on Monday evenings; also, on some Thursday mornings. You can follow Green Heart Bakery on Facebook; I always post a photo when I deliver there, listing some of the offerings. 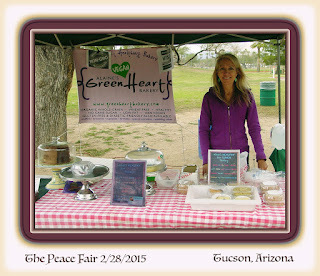 Yes, a good assortment of Green Heart's cookies, muffins, brownies and apricot date bars can be found at Crossroads Coffee, 8898 E. Tanque Verde Rd, 85749. Also on Facebook, you will see that I post to remind when Green Heart will be at UA Mall farmers market for Wednesday lunchtime. It's always a pleasure to see the students, staff and faculty there! We hope to see you soon :-). Good health to you! An organic whole-grain GF vegan fruit-sweetened cake w/tofu-based frosting.